Read on for farmer-to-farmer insight, direct “from the farmers field”. Each column features a different farmer, and different farm type. The Thurston County Ag Sounder Newsletter was the 2018 state winner of the National Association of County Agricultural Agents (NACAA) ‘Communications Award’, and a regional finalist at the NACAA national awards. Hoorah! Click below for Ag Sound Archives. 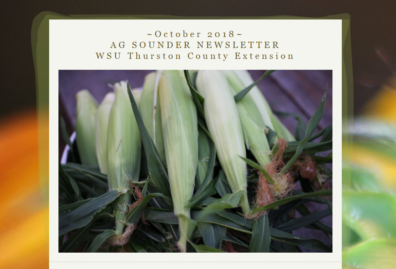 To sign up for the Ag Sounder Newsletter, or join the southsoundag list serve, please contact the Thurston County agriculture agent: bramwell@wsu.edu.